That's the Mackie Building in the distance. "This large commercial structure of 1876 is representative of the period of Milwaukee's rapid growth and commercial development following the Civil War." -- Historic American Buildings Survey. Alexander Mitchell was an immigrant from Aberdeenshire, Scotland who came to Milwaukee in 1839 to enter the insurance business. The company eventually evolved into a bank, and Mitchell became a powerful banking executive. Mitchell also served in congress and was nominated to run for governor, but declined the nomination. Mitchell built an estate on Grand Avenue that today is the Wisconsin Club. He is the namesake of Mitchell Street, Mitchell Park, Alexander Mitchell Integrated Arts School, Alexander Mitchell Public Library in Aberdeen, South Dakota, Mitchell South Dakota and, of course, this building. Mitchell also built the Mackie Building which shares the East 200 block of Michigan Avenue. It wasn't all work, though. Mitchell was an avid fan of curling, and founded the Milwaukee Curling Club in 1840 and was prominent in the Grand National Curling Club. 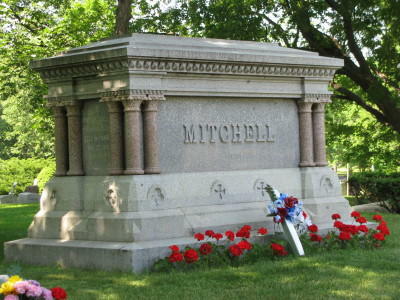 Alexander Mitchell is buried in the Mitchell family plot at Milwaukee's Forest Home Cemetery.